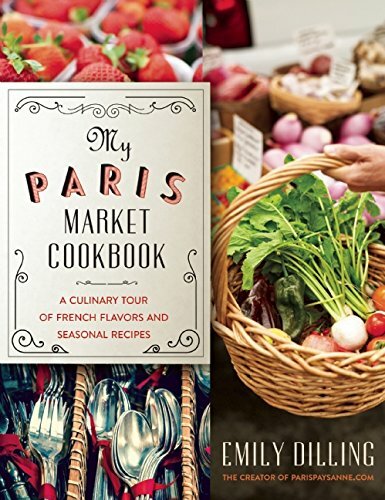 My Paris Market Cookbook: A Culinary Tour of French Flavors and Seasonal Recipes takes readers on a tour of Paris’s growing artisanal and craft food scene. Visits to markets with local farmers, coffee roasters, and craft brewers in the city offer insight into the exciting development of local food movements in the city of lights and its surrounding region. Complete with seasonal recipes inspired by local products, farmers, chefs, restaurants, and cafés, My Paris Market Cookbook brings the experience of shopping for, and cooking with, fresh locally grown products into readers’ homes and kitchens. Emily Dilling, originally from California, has called Paris home for the last ten years. A writer who is passionate about food and the people who grow and make it, she founded Paris Paysanne, in 2010 as a means of documenting her quest to find farmers and local, seasonal produce in the Paris markets.. She can often be found exploring Paris's burgeoning craft coffee, beer, and food scene, tending to grapevines in the Loire or cultivating her community garden plot. She is the author of My Paris Market Cookbook: A Culinary Tour of French Flavors and Seasonal Recipes (Skyhorse Publishing, September 2015).